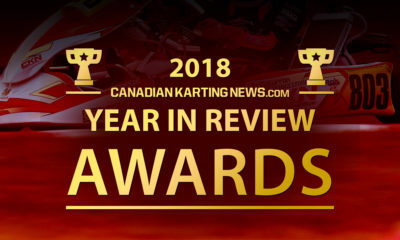 CRFKC Briggs Report: Awesome Day for Team Karts & Parts in Round Four – CKN | CanadianKartingNews.com | Because Karting is a way of Life! A little overshadowed by Sunday’s Champion Ron Fellows Karting Challenge Briggs & Stratton Summerfest spectacular, we almost forgot to report on Saturday’s Briggs & Stratton classes. 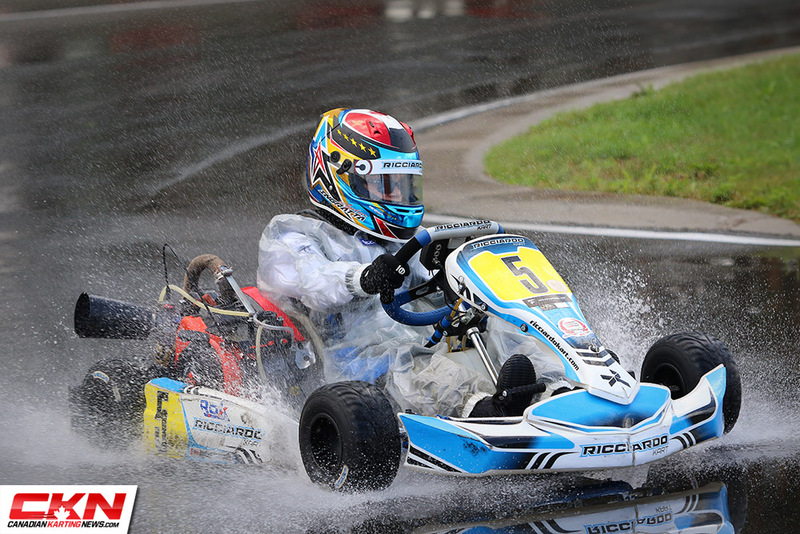 It was an awesome day for Karts & Parts as the team was able to score three of the five victories in extremely challenging conditions. On and off rain throughout the day left many races unpredictable, with some classes getting caught out on slick tires on a wet track. There were also drivers taking a gamble on a drying track, which for some it paid off, while for others it did not. Needless to say, the entire paddock was on their toes all day long. 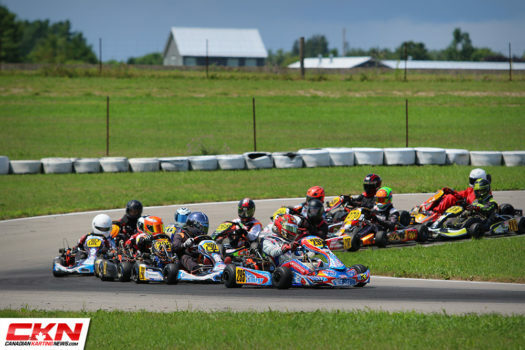 With forty karts on track in Briggs Senior, it was an epic showdown as expected. 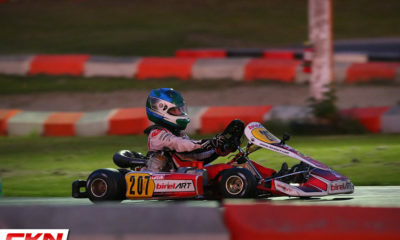 The Final saw Jordan Prior (BirelART) jump out front and lead the first three laps. Spencer Todd (Kosmic) then took to the lead as Prior slotted in behind. 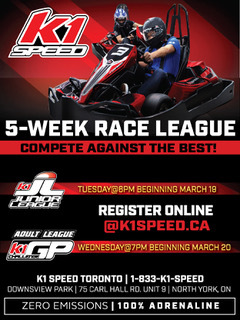 Running in tandem, the two leaders were caught by another pair, Pearce Herder (Awesome Kart) and Jon Treadwell (Intrepid) and they made quick work of the lead duo on lap six to take over the race. Todd kept himself in the mix and returned to the point with three laps to go but it would only last a lap until Herder took the lead for the final time on lap eleven. 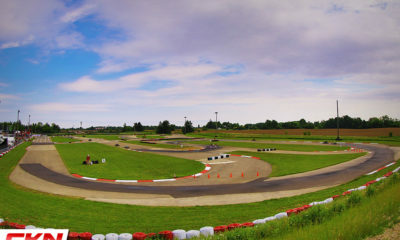 Holding off Treadwell, Prior, Marc Stehle (Ricciardo) and Marco Signoretti (Energy Kart) throughout the final lap, Herder scored the win with Treadwell and Stehle joining him on the podium. Prior initially crossed in third, but was accessed a penalty for jumping the start. With his fourth straight podium, Treadwell holds a commanding lead in the championship heading into the final stop at Goodwood. Behind him, Herder, Prior, Signoretti and Todd are all within a handful points of each other for the runner-up position. In another thrilling battle that featured six lead changes in the first eight laps, the Junior Briggs drivers put on a show. 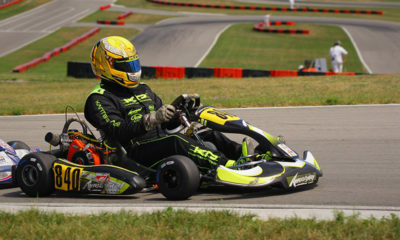 Owyn Thomas (Intrepid) led the early stages after winning the dry PreFinal. While it was no longer raining, drivers were on rain tires for the Final on a wet track. At lap three Zain Ikram (Kosmic) overtook Thomas for the lead, but the Intrepid driver returned to the point the following lap. Thomas found trouble on lap five and slipped back to eighth as Anthony Boscia (BirelART) inherited the lead in a major shuffle of positions. 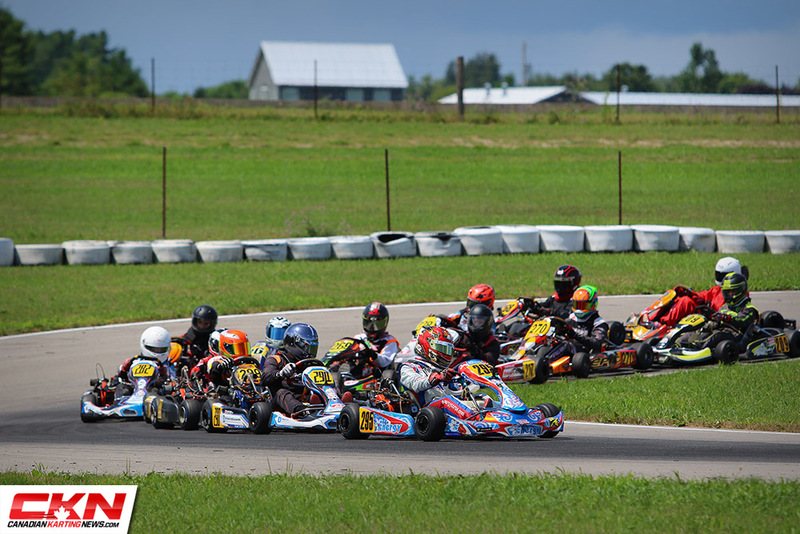 The halfway point saw Avery Miller (Energy Kart) and Junior Lindgren (K&K Kart) work together and put themselves out front. Lindgren then overtook on lap eight and never looked back as he was the first to the checkered flag. Miller came home second, just ahead of Boscia. 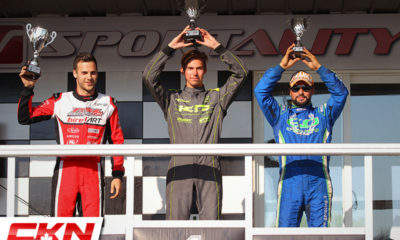 Eight seconds later, Nicky Palladino (Intrepid) crossed the line in fourth while Gianluca Savaglio (Intrepid) was a distant fifth. Unfortunately for Lindgren, some trouble in the tech tent saw him surrender the victory with a technical DQ. This moved Miller to the top of the podium. 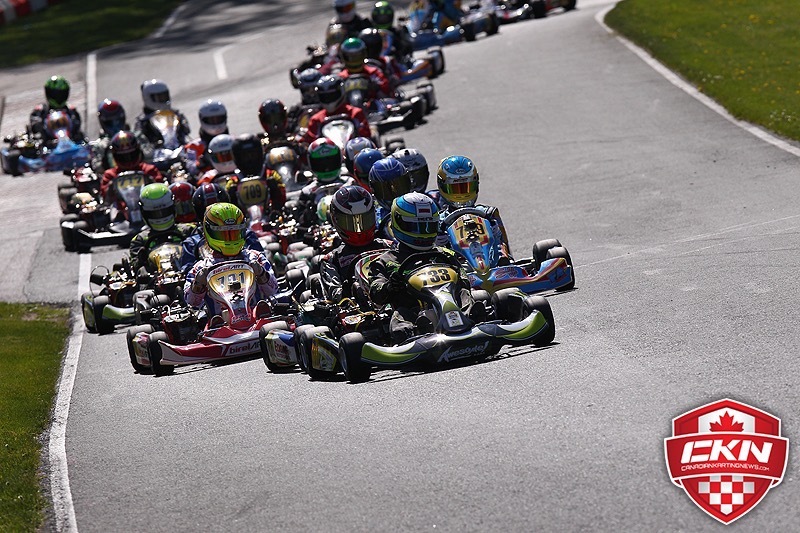 The rain came pouring down on the Junior Lites almost immediately after they received the green flag. Caught out on track on slick tires, it was survival that earned drivers the best results. 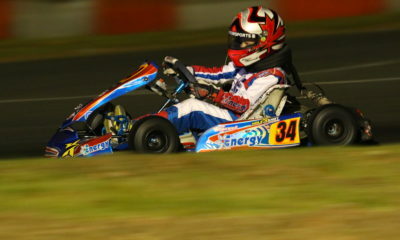 Managing the conditions best was William MacCormack (Awesome Kart). He started the race in the fifteenth position and credited his winter snowcross racing for helping him keep control in the unexpected conditions. MacCormack took the lead on the final lap from Mackenzie Matthews (Awesome Kart), who led most of the second half of the race. 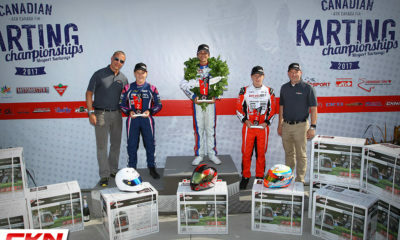 Third place went to Peter Zito (Intrepid) followed by Ethan Donkers (TonyKart) and Steven Navratil (Awesome Kart). 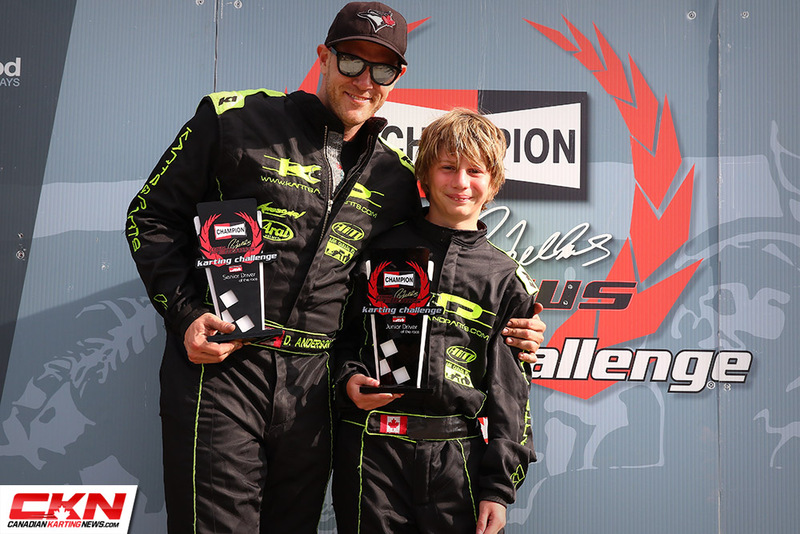 After 22 karts started the race, only 10 were able to make it to the finish and for his efforts, MacCormack was the Pfaff Motorsports Junior Driver of the Day. 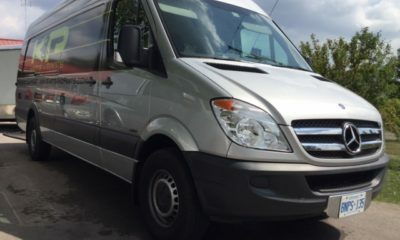 360 and Go! No problem for Brayden Lindgren • • • Looking forward to more video clips from @throttle_media_productions! On the grid for their Final, the Sun was shining on the Masters but the track was still quite wet. Many were keeping a close eye on the Briggs Junior race before them and when it was time to release the grid, a few drivers took the gamble and bolted on their slick tires. The first lap was quite intense as everyone struggled to find grip, regardless of tire choice, but quickly Anthony Castro (Intrepid) and David Anderson (Awesome Kart) showed that their gamble had paid off. The two drivers moved through the leaders early and by three they were 1-2. Teammates Jamie MacArthur (K&K Kart) and Keith Barrick (K&K Kart) were able to keep up with the leaders, managing the wetter parts of the track better than their rivals, but as the laps ticked off the track became more and more difficult for them to drive with their soft rain tires. Anderson pressured Castro until the final lap when he made his move. 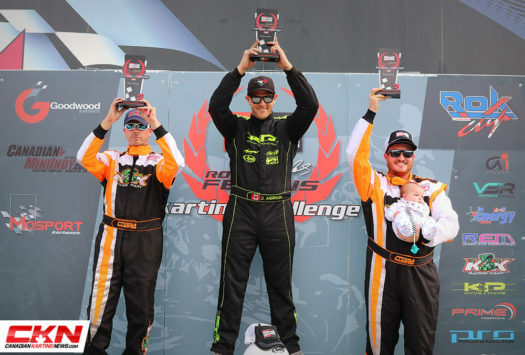 With MacArthur and Barrick still within striking distance, Anderson made sure not to push the envelope too far and after coming through the final corner side-by-side, it was a drag race to the finish line. It was too close to call by eye and so a look at the timing screen was required. By a mere 0.007 seconds, Anderson was victorious and with it, he took home the Pfaff Motorsports Senior Driver of the Day. 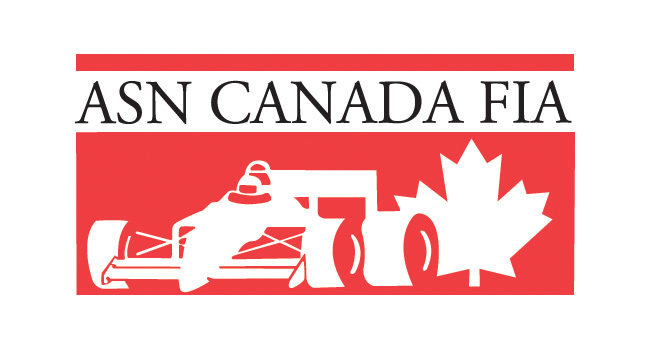 Castro did cross in second but received a two-position penalty for contact early in the race, knocking him off the podium and moving MacArthur and Barrick onto the podium. Barrick was making his return to the sport this weekend after the birth of his daughter earlier this summer. Rain or dry, there has been no stopping Ayden Ingratta (Ricciardo Kart) this year in Briggs Cadet. 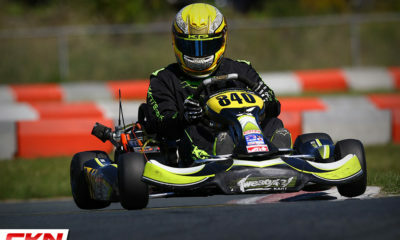 In the very wet Final, Ingratta lapped more than a second faster than his rivals to pull out to a nineteen-second victory. 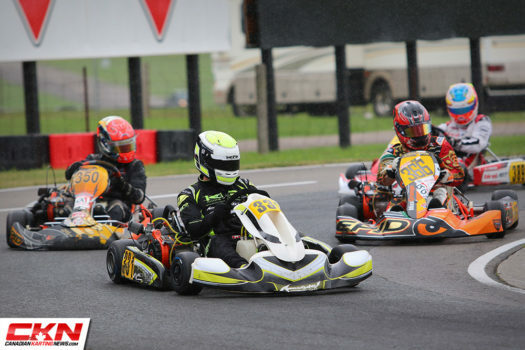 Scotty Watkins (Top Kart) moved into second on lap two and held the position for the remainder of the race while Major Makovskis (Intrepid) and Jordan Di Leo (Intrepid) duked it out for third. They traded the position until lap seven when Di Leo spun. 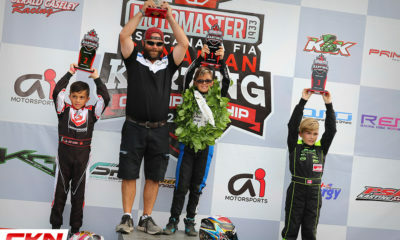 This allowed Makovskis to finish on the podium ahead of Ryan Maxwell (Energy Kart) and Carson Bartlett (Gold Kart), while Di Leo slipped to sixth at the finish. 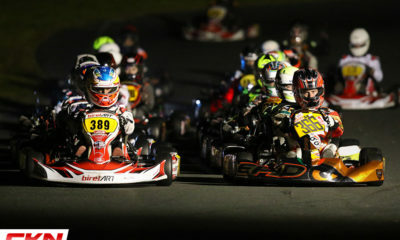 The final round of the Champion Ron Fellows Karting Challenge will be held under the lights at Goodwood Kartways. The annual night race takes place on Saturday, September 8.